Citation Information: J Clin Invest. 2018;128(11):5083-5094. https://doi.org/10.1172/JCI120245. Cycling memory CD4+ T cells are enriched in Tregs. Frequency of cycling CD4+CD45RA– T cells detected by (A) Ki67 expression in HCs (n = 20), IRs (n =21), and INRs (n = 16) or by (B) CD71+ expression in HCs (n = 10), IRs (n = 20), and INRs (n = 16) among subjects from the Russian cohort (A) and the Cleveland cohort (B) (*P < 0.05). (C) Heatmaps of cell-cycling–related modules comparing cycling and noncycling memory cells (P < 0.05) from HCs, IRs, and INRs of the Russian cohort. 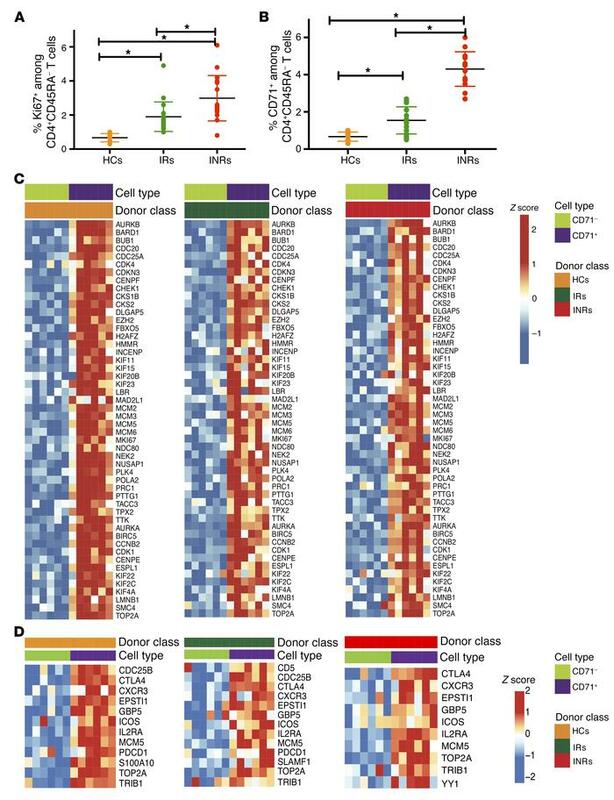 (D) Heatmaps of the Treg signatures showing upregulation (P < 0.05) in the cycling memory (CD45RA–CD71+) CD4+ T cells compared with signatures in noncycling memory (CD45RA–CD71–) CD4+ T cells from HCs (n = 6), IRs (n = 6), and INRs (n = 6) of the Russian cohort. P values for A and B were determined by a Wilcoxon rank-sum test. Data represent the mean ± SD.